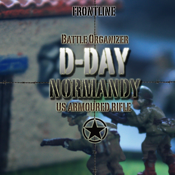 "D-Day - Normandy - US Armored Rifle Company"
New to the series, with slight improvements. This App helps you to quickly organize your Armored Rifle Company for a typical 15mm tabletop game together with the Book "Turning Tide" (You need a copy of this book to fully use the content of this App). Configurate a complete Armored Rifle Company with all needed elements (HQ, Combat Platoons, Weapon Platoons and Support Platoons) and see the total score of points in any change and combination, no limitation in points. List, view and store your company within the Battle-Screen for an upcoming tabletop battle with your friends. Just choose your platoons in the configurator tool and build up your company list. Configurate a complete Armored Rifle Company with all needed elements (HQ, Combat Platoons, Weapon Platoons and Support Platoons) and see the total score of points in any change and combination, no limitation in points. Store your current battle list, use it during the game and even mail it to your mail account or to your friends or your GM. - New: Two lists in one tool!